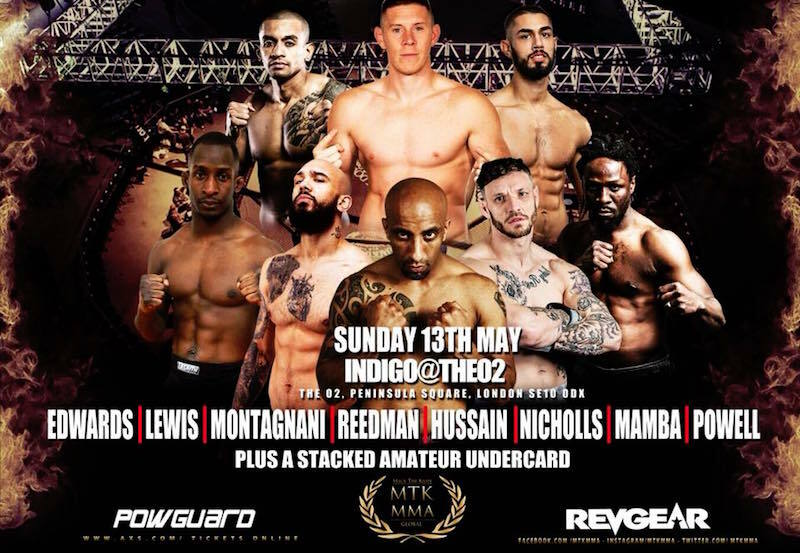 MTK Global MMA has released full details of their stacked debut card on Sunday 13th May at Indigo at The O2 Arena in London. Alex “The Mean Albatross” Montagnani will feature in the main event against Shah Hussain. Montagnani (10-3) will be looking to rebound from his submission loss against Craig White at Cage Warriors 92: Super Saturday. The Team Mean and Savage Squad representative was on a 3 fight winning streak before the bout with White. Shah “No Pain” Hussain (11-12) is also coming back from a loss after winning 3 fights in a row. Hussain was submitted by UFC veteran John McGuire at ROC 4 – Rise of Champions 4 last September. Shah has plenty of experience in the cage and has fought in the UCMMA, BAMMA and Cage Warrior organizations. Team Titan’s Luis Gonzalez will return to action for the first time since 2016 against Daryl Grant. Gonzalez (6-4) is a veteran of the UK’s UCMMA and Shock n’ Awe promotions. Former WCMMA welterweight champion John Nicholls (2-1) will be looking to bounce back after suffering the first loss of his professional career against Josh Plant on the BAMMA 34 preliminary card. Nicholls racked up a 4-1 amateur record on the WCMMA and UCMMA cards held at the Troxy in East London. James Reedman (2-1) is coming off a big win against Jahreau “The Nightmare” Shepherd on the BAMMA 34 preliminary card in March. Reedman stopped the Savage Squad member in the second round, handing him the first loss of his professional career. James trains out of the NFM gym in Windsor, where the coaching staff includes UK MMA veterans Nick Osipczak and Dean Amasinger.